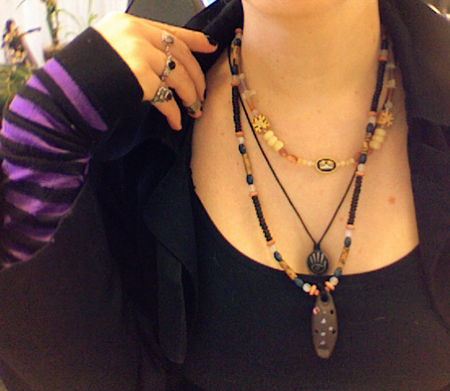 Here’s a bad webcam photo of some beadwork I did recently. (Just the necklace for the ocarina, I’m afraid, not the other necklace) Though speaking of photos, I met Michael Olsen of ZorkMagazine last night at an event for the Timothy Leary archive and he snapped a couple photos of me. His photos of the event can be found here. Met a lot of really amazing and fascinating people there. For the past couple of weeks, I’ve been downloading tons of video off archive.org to put together a retrospective of the late Dr. Leary. I’ll post some updates on this blog when there’s more to show. You are currently browsing the Obscure Star Studio blog archives for February, 2009.